Of course, what such data does not answer is why. 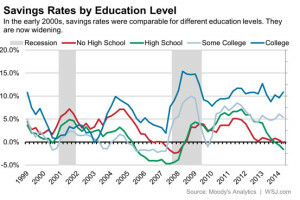 Why do former college-goers save more? Mr. Zumbrun gives some potential insight into this dynamic with another set of data/chart which seems to correlate the relationship between income levels and savings rates. As one might imagine those who earn more tend to save more. And on average college graduates tend to earn more as a whole, so that could very well speak for the increased savings rate. But perhaps something fundamentally happens in college to encourage savings. Maybe, as the article’s title insinuates, one of the lessons learned in college is how to save. Speaking from personal experience it wasn’t until I was in college that this former spendthrift changed his ways, going in with holes in my pockets and leaving a relative miser. I’ve seen the same shift in others’ lives as well. Regardless the reasons if college has some positive effect on personal savings thereafter we have cause for hope and even celebration. If students got nothing else from their four years than some good memories and the ability to put aside funds on a regular basis those were some well spent years. Elsewhere, we’ve explored some practical ways to save money for school. Look around in the proper chapter or in the categories section of this site for more on this topic.